While most of my time since returning home has been spent skipping happily around the kitchen, on Monday night I went along to a supper club here in Manchester and let someone else do the cooking for me. It was my first time at a supper club – eating at the chef’s home, around their dining table with a group of strangers. It’s quite a unique dining experience, and one I’m definitely going to repeat. This particular club is run by a former chef at a vegetarian restaurant I love, and serves neither meat nor fish, so it’s absolutely perfect for me. Our meal went one step further and was actually vegan, in order to accommodate a fellow diner. It made a pleasant change not to feel like the nuisance who doesn’t eat meat! It was Mexican Monday, though the weather remained decidedly British. Not to fear, as there was a roaring fire and a gingerbread margherita (Best. Drink. Ever) on arrival, and the food was certainly exotic enough: sopa seca (dry noodle soup) for starters, followed by a feast of rice, garlicky spinach, Mexican salad and stew, and then an incredible chocolate chilli dessert with apple and ginger salsa. Simply divine! 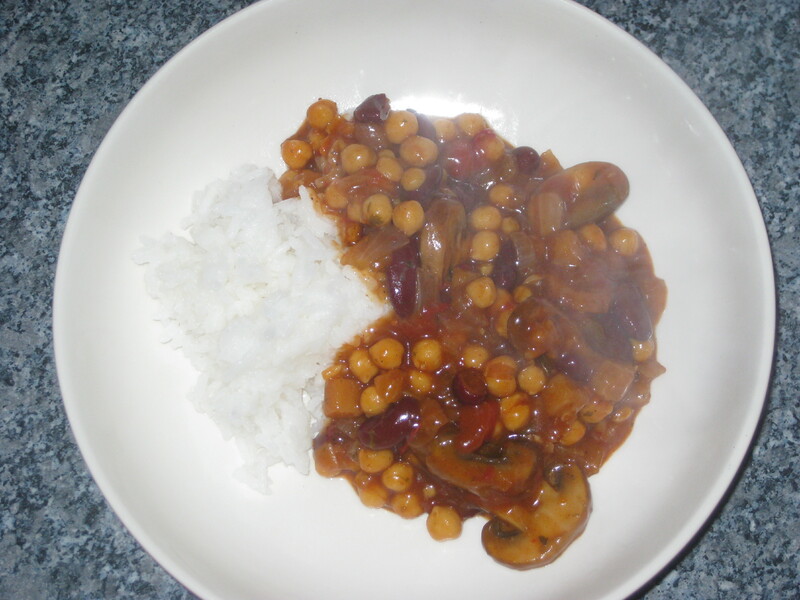 Inspired by the Mexican feast, behold my own much simpler offering: a quick, tasty bean and mushroom chilli. It might not dazzle a room of hungry strangers, but it’s good enough for family and friends! 1. 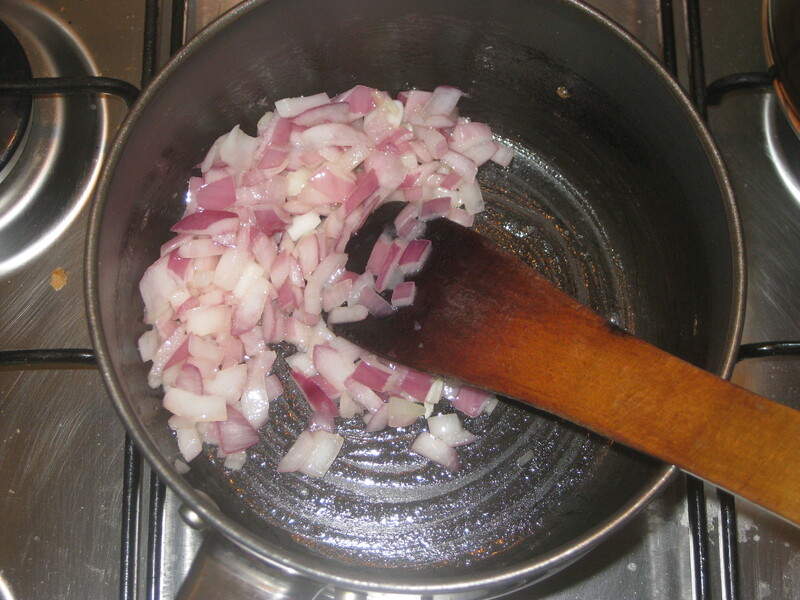 Heat the oil in a large pan and fry the onion and sugar over a high heat for about 5 minutes. 2. 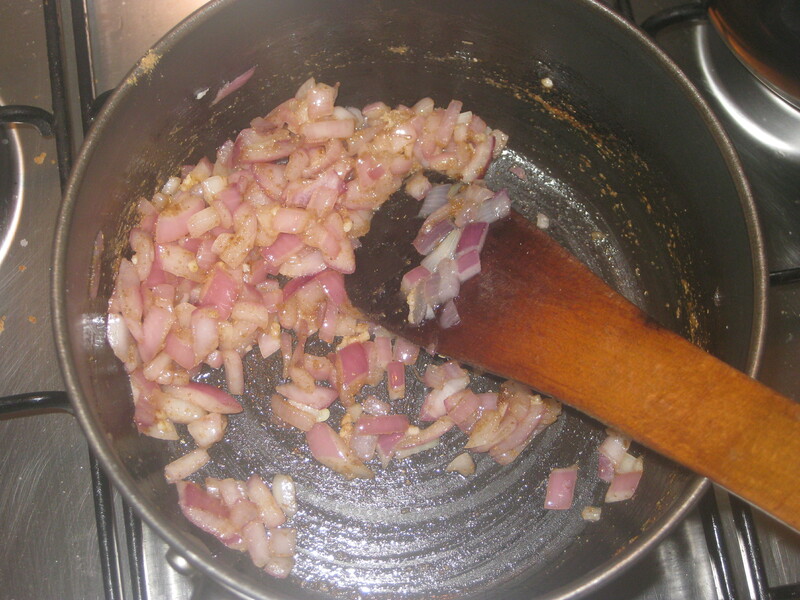 Add the garlic and coriander and cook for another 2 minutes. 3. 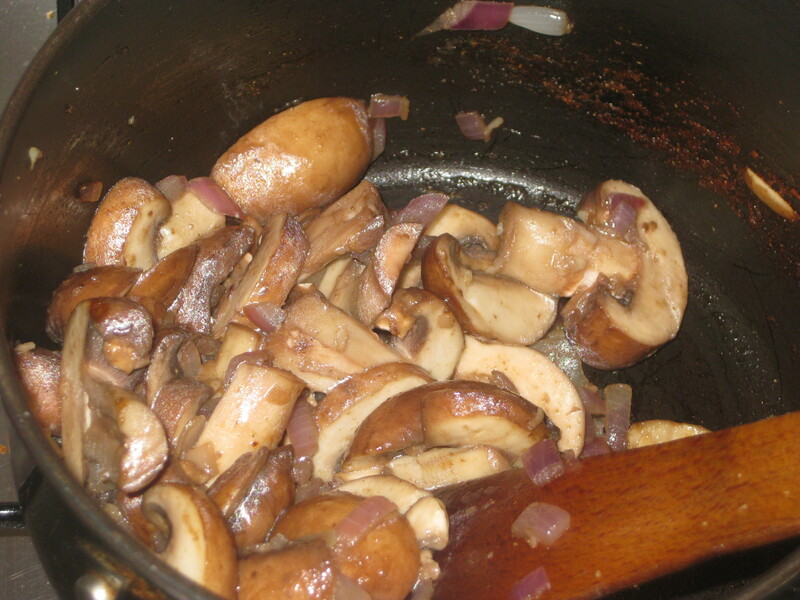 Add the mushrooms and fry for 5 more minutes. 4. 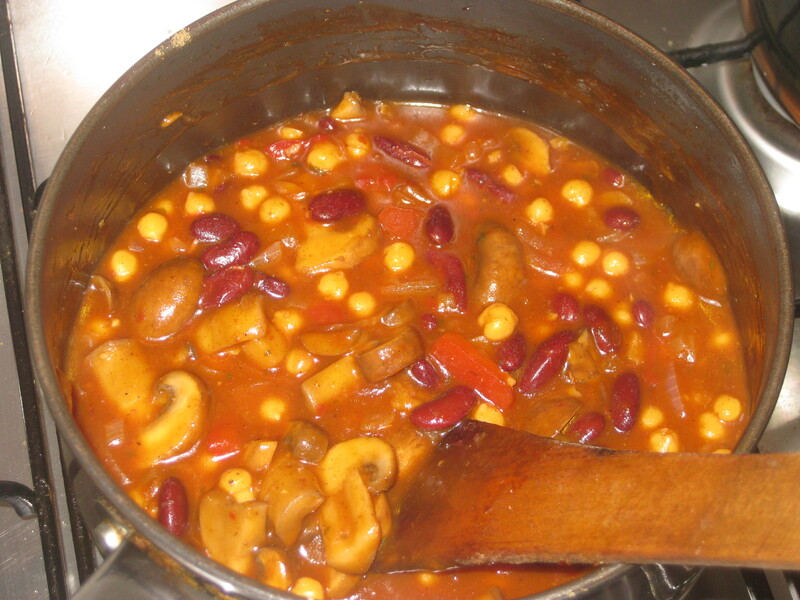 Pour in the pepper sauce, stock, chickpeas and kidney beans. Bring to the boil and simmer gently for 20 minutes. Meanwhile, you might want to get some rice going. 5. Season the chilli and serve with rice, a jacket potato or nachos. 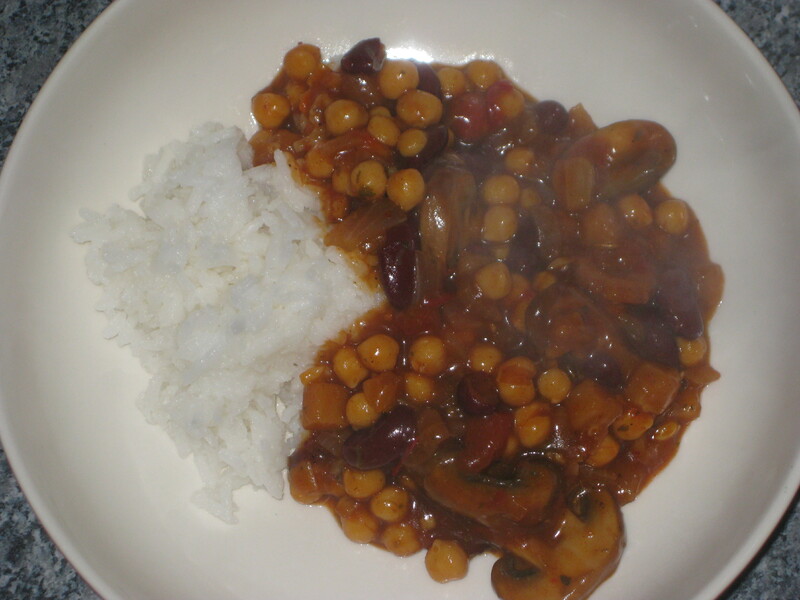 This entry was posted in Vegan Recipes and tagged bean and mushroom chilli, Mexican food, vegetarian chilli. Bookmark the permalink.